Recently I traveled to Kauai to visit family and take a vacation. It’s a beautifully unique place that is a visual feast for the eyes. To name a few recommendations; boat tours of the world’s second highest coastal mountainside known as the Na Pali Coast, snorkeling at the many beautiful beaches, sight-seeing or hiking Waimea Canyon (often called Hawaii’s Grand Canyon), waterfall and swimming-hole hikes, and simply just relaxing on the beach. There’s a variety of food from traditional Hawaiian pulled pork or fresh ahi poke sushi bowls; to Filipino, Japanese, Mexican, Italian and all the in-between you can think of. It’s a melting pot of cultures and food styles. The Hawaiian Islands are known for its tropical exports including coffee, coconuts and macadamia nuts. This amounts to lots of yummy food and inspirations for recipe ideas. I got hooked on all things passion fruit out there. My brother and I cooked mango banana compete topped pancakes with passion fruit syrup. This tropical breakfast is as good as is sounds. However, I did not want to post a recipe with this syrup or fresh passion fruit, as they are not commonly found ingredients in most parts of the world. If you’re lucky enough to find some then I’d recommend using it in your cooking. 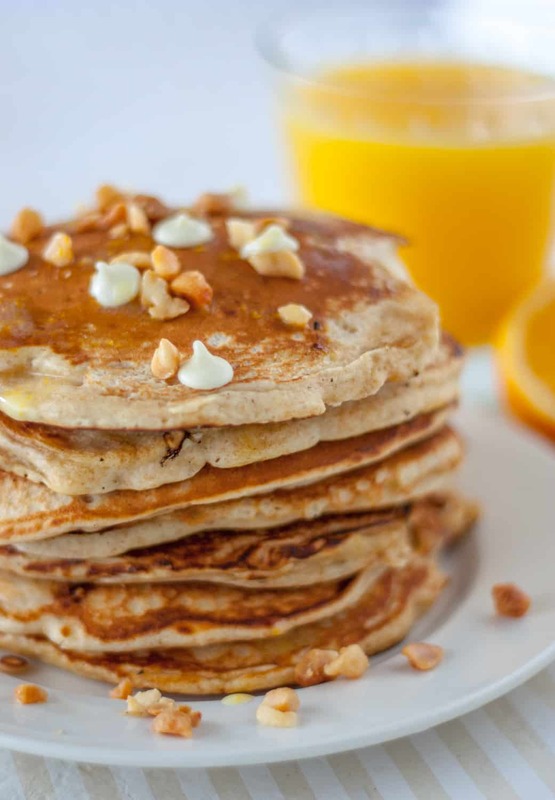 I chose macadamia nuts as the focus of this for this tropically influenced White Chocolate Chip Macadamia Nut Pancakes with Orange Butter recipe. These are common in most households and can easily be found. Pair this with white chocolate chips and you have pancakes that remind you of white chocolate macadamia nut cookies. The nuts add crunchy texture to the fluffy and silky pancakes. Spread on orange butter and give it a citrusy tropical kick. This would be a reward yourself for being awesome all week breakfast, so remember all good things in moderation. To keep all waffles crisp while making entire batch, place cooked waffles in oven at 200º F until ready to serve. Don’t stack on top of each other or they will steam and get soggy. I shot this in natural light at 1/160 sec, f/ 1.8, ISO 400 . I’ve always wanted to do a photo shoot of a stack of pancakes. I know it’s how they are usually shot but something about this setup makes them so appealing. Of course this isn’t practical for eating, unless you are really hungry, but it was fun anyways. Make sure you place the most evenly rounded edges on the side you are shooting. Even if they are slightly different sizes you can line them up to make an even looking stack. I’d suggest staggering them slightly to help the viewer see each pancake. Some added white chocolate chips and macadamia nuts on top show what ingredients are inside, and add more to the scene. The orange and cup of orange juice have the same effect, as well as creates a more complete breakfast scene. 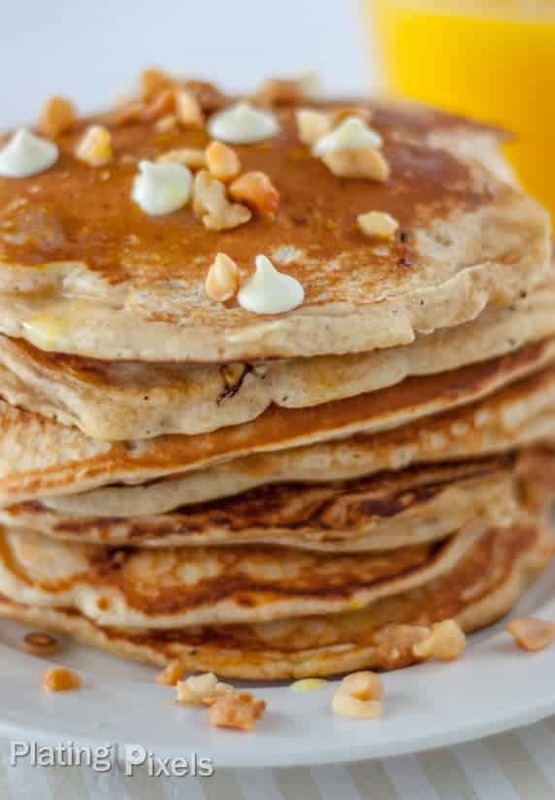 White chocolate and macadamia nuts add crunchy texture to these fluffy and silky pancakes. Spread on orange butter and give it a citrusy tropical kick. Combine first 3 ingredients to make orange butter. Set aside. In separate bowl combine white and wheat flours, sugar, baking powder, baking soda and salt. Stir together with whisk. In separate bowl combine buttermilk, ¼ cup of orange juice, oil and 1 egg. Stir together with whisk. Add buttermilk mixture to flour mixture, gently stir until combined and just moist. Let stand for 10-15 minutes. Then gently stir in white chocolate chips and ½ cup macadamia nuts. In a separate bowl, beat egg white with a whisk until medium peaks form. Gently fold this into batter. Preheat pan to medium heat. Coat pan with cooking spray. Spoon roughly ¼ cup of batter into pan for each pancake. Cook 2-3 minutes until bubbles form on top and bottom is golden brown. Turn pancakes over and cook 2-3 minutes more until done. 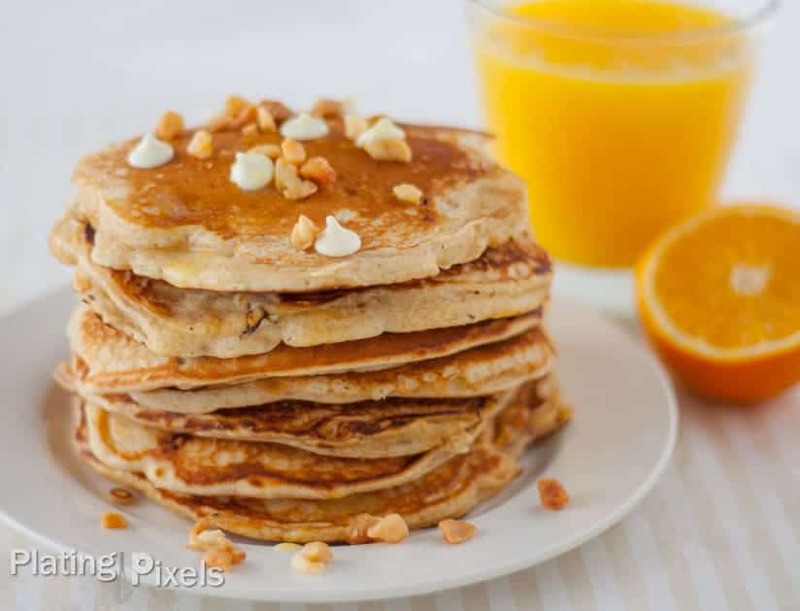 Spread orange butter mixture on top of pancakes and sprinkle remaining chopped macadamia nuts as topping. 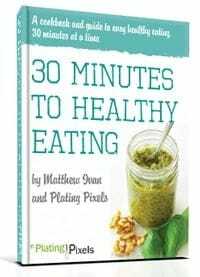 – You may need to add more flour or buttermilk to thicken or thin batter to your liking. A thick batter should form that holds it’s shape once poured into heated pan. – It’s best to soften butter at room temperature, instead of microwaving.